What a day! Due to global warming we’re encountering a large number of melt water rivers, far more than normal for this time of year. We had to divert 9km from our route today as these fast flowing rivers are just too dangerous to cross. Shaun nearly lost his sledge in one, completely soaking his gear. To add to this frustrating scenario, the weather has again changed for the worse forcing us to make camp early whilst the snow storm passes. We’re all quite tired and hungry but keeping positive. We know the descent will be testing, what with all the crevasses and hummocks that lie ahead, yet we’re still smiling. We’re getting pissed off with the bloody weather and are drooling for a big juicy steak, a pint and a shower. 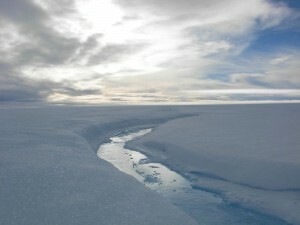 This entry was posted in Greenland and tagged climate change, melt water. Bookmark the permalink.